As Autodesk continues to move towards a single business model, we want to give you, our customers, an insight into these changes and outline the procedure of switching from Maintenance to Subscription (M2S). Since June 2017, upon renewal of your product, you will be able to move your products on a maintenance plan to Autodesk's subscription (Rental) Model. The price to switch will increase annually, so the earlier you switch to a subscription, the less it will cost - giving you greater savings compared to those who wait to move. This will allow you to lock in this special price for up to 3 years, while continuing to receive discounted pricing for as long as you renew. Read our recent blog, Autodesk Maintenance Change, for more information. There have been many questions about the move to one model, so we've answered some of the most frequently asked questions below to give you a better undersanding of what's to come! Customers will get a new subscription license at a discounted price for each seat switched. Customers will be required to give up their perpetual license and move to a subscription license. Customers can continue using installed and activated previous versions from their maintenance plan for products included in the new subscription. Customers do not need to uninstall software immediately; they can reconfigure or continue using installed software for products in the new subscription, until they are ready to move. Q: Will a switch be processed within 10 days post expiry as these renewals are still classified as "on-time"? A: It is important that all orders to switch from maintenance to subscription are completely processed in Autodesk systems PRIOR to the expiration date in order to be eligible for this special offer. Orders must be submitted 5 days before the expiration time for processing. Q: If a customer has 2 contracts, 1 currently Maintenance & 1 Currently Subscription Term, if they switch the maintenance plan to subscription, can they switch and align/merge with the subscription contract? A: The M2S subscription will always start a day after maintenance plan ends. It will not be possible to align the M2S subscription to a specific date. It is recommended to extend your maintenance to plan to any other contracts to ensure that your M2S contract will have the correct dates. Q. Is it only possible to switch to an individual product? A: Switching is possible as long as there is an eligible path to switch. Q. If a Customer has Building Design Suite Premium but is just using Revit and Switching to AEC collection. Can he/she use same Revit or need to download once again? A: For single-user, if it’s individual product to individual product or IC, they can update SN and reactivate. No uninstall / reinstall. However, for single-user, if it’s suite to IC, or suite to individual product, or individual product to suite, you cannot update SN and reactivate due to different Product key. Customer will need to uninstall and reinstall. For multi-user, no uninstall / reinstall is needed, just a new license file. 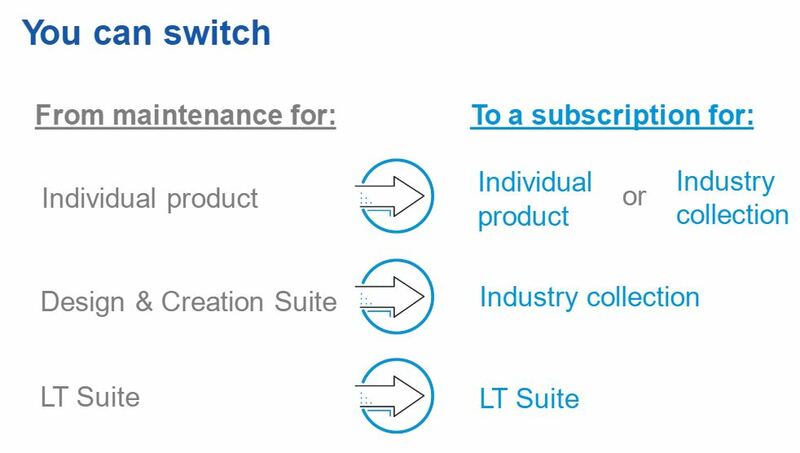 Q: When making the switch can you also switch Multi-User Maintenance Plan to Single User Subscription? A: At this time, when you switch products on a maintenance plan to a subscription you will not be able to change access type e.g from single user to multi user. Q. What does this mean for your wallet? A. As explained in our recent blog, Autodesk Maintenance Change, basically, at the time of renewal you can decide when and if you are ready to move to the subscription model for 5% more than the cost of your current maintenance plan renewal. This works out far cheaper when compared with the cost of a new subscription. If and when you do decide to make the switch, you can lock-in at the discounted subscription price for 3 years. We know you'll probably have questions as these are big changes, so do not hesitate to contact us by clicking below and we can discuss the options that best suits your technical and business needs!